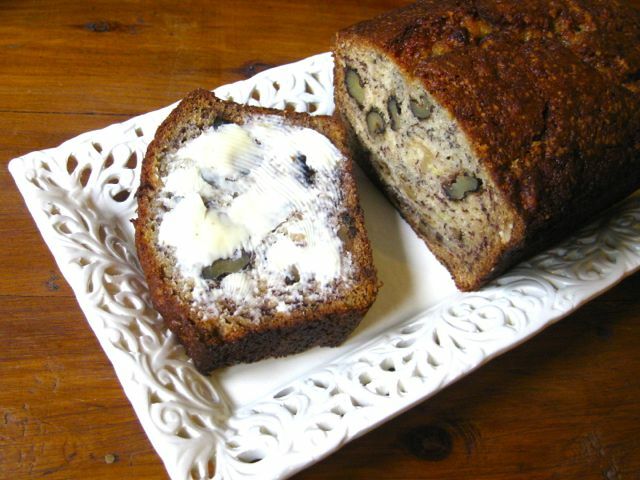 I make this dense, sweet loaf when my stash of frozen bananas is getting out of control. You know when you buy bananas and the last one or two gets over-ripe and no one eats it? Don’t throw them away, throw them in the freezer and when you’ve got 3-4 in stock, defrost them in a bowl. There’s lots of liquid, and they don’t look very pretty but it’s a super way to be less wasteful and I actually think the soggy old revivified fruit makes the best banana bread. Plus it does away with any need to mash, just cut the top off and slide in that soggy stick of banana mush. I’ve got choc-chips and walnuts as optional here but I don’t use either. I prefer unadulterated banana bliss, and it toasts up a lot better when it’s plain. To prepare this loaf for the freezer, cut it up the next day into slices about 1 inch thick. Put a layer of cling-wrap or baking paper in between each slice and wrap up two or three slices at a time with cling wrap. Then all you have to do is decide you want cake for breakfast, take them out of the freezer and pop them straight into the toaster. Give them a solid toasting, so the slices are brown and crispy on the outside and soft and fluffy on the inside. Add nuts or chocolate. You can also lay some walnuts on the top. Bake for 1 1/4 hours, or until well browned on top.